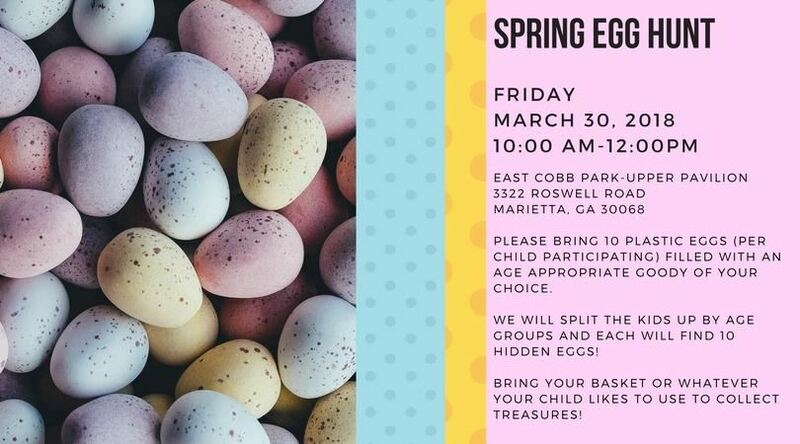 Come join us for a fun egg hunt at East Cobb Park! This is a great time to bring the littles for their first egg hunt and not get trampled or deal with crowds. We are going to meet up at the playground/pavilion off to the right hand side when entering the park. If everyone can pitch in and bring 10 filled eggs to share per child, we will hunt eggs and make sure everyone has 10 eggs when they leave. Hope to see you all there!! Please let us know if anyone attending has an allergy that we should all avoid in our treats.